On a cold, wet morning in early December, a group of students and staff from the Yale Sustainable Farm Project huddled closely together under the farm’s pavilion. Finally, a minivan pulled up and Wendell Berry slowly emerged. He wore a long, black overcoat and a stocking hat that read “The Aldo Leopold Foundation.” The gentle, if slightly mischievous, sparkle in his eyes belied his seventy-nine years. He smiled genuinely during introductions, and spoke with a casual, almost nostalgic, Southern drawl that pulls you in and invites you to listen more attentively. Wendell Berry has been an iconic figure of American arts and letters for nearly half a century. He has penned (he famously and quite defiantly doesn’t own or use a computer) dozens of novels, short stories, and essays, and is perhaps best known for his poetry. Berry talks like a poet, with precision and a thoughtfulness for the beauty of language rarely heard these days. 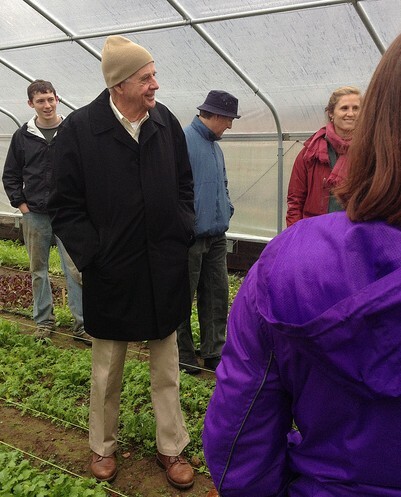 Wendell Berry listens to students describe the Seed to Salad program at the Yale Sustainable Farm Project. Photo by Zoe Keller. He was coming to Yale to accept the Chubb Fellowship, an honor bestowed by Timothy Dwight College, one of Yale’s twelve residential colleges. In accepting the Fellowship, Berry joined a long and esteemed list that includes the likes of writer Chinua Achebe, musician Wynton Marsalis, paleoanthropologist Richard Leakey, Nobel Peace Prize Laureate Aung San Suu Kyi, and President George H. W. Bush. In addition to a public talk to a packed house at New Haven’s Shubert Theater, there would be formal dinners, a private wine and cheese (and appropriately for the native Kentuckian, bourbon) reception. But for one of America’s greatest agrarian philosophers, writers, and activists, the highlight would be a tour and luncheon at the Yale Sustainable Farm Project. Berry’s writing has attracted international acclaim and garnered him numerous awards. He is a Fellow of the American Academy of Arts and Sciences, and a recipient of the Richard C. Holbrook Distinguished Achievement Award. In 2010, Berry received the National Humanities Medal, and in 2012 he gave the Jefferson Lecture, the highest honor bestowed by the federal government for distinguished intellectual achievement in the humanities. And yet, listening to him talk with Yale students in the winter rain, I was struck by his humility. As a fellow Midwesterner, he reminded me of my grandfather, and so many others I know from back home—simple, unassuming, hard-working, committed farmers. In many respects, our initial conversation felt like reacquainting with an old friend. Our rural landscape has changed radically since Berry published The Unsettling of America: Culture and Agriculture in 1977. Considered by many to be his magnum opus, the book is both a cautionary tale of the social and ecological consequences of a nation divorced from its land, and also an impassioned call for a more rooted citizenry. How have we responded to Barry’s agrarian call to arms? Who, if anyone, is watching the land? A report released earlier this year by the U.S. Department of Agriculture’s Economic Research Service paints a complex picture of agrarian America. It shows significant growth in the number of small farms, owing largely to the popularity of CSAs, chic farm-to-table restaurants, and other locavore trends. In fact, the mean size of a farm these days is only forty-five acres, and two-thirds of all U.S. farms are one hundred acres or less. However, these farms together comprise a small fraction of total cropland. By contrast, the largest farms, those greater than two thousand acres, account for only 2.2% of America’s farms but control over 34% of our country’s total cropland. According to the report, the greatest decline in terms of both the number of farms and the amount of cropland is in middle-sized farms between one hundred and five hundred acres, like Lane’s Landing. And diversified farms, like Berry’s, have given way to more specialized operations, particularly for meat and dairy production. The exponential growth and influence, both practical and political, of multi-national agribusinesses has further complicated our connections with the land. An exploded view of the globalized food system would reveal an extensive professional assortment including geneticists, chemists, advertisers, extension agents, insurance agents, economists, crop dusters, commodity traders, lawyers, truck drivers, elevator operators, implement dealers, migrant laborers, and farmers. These days, a so-called “conventional” farmer needs to understand as much about futures trading and information technology as agronomy or animal husbandry. In such a complex system, it’s hard to find time to watch the land. It is no secret that agribusiness giant Monsanto dominates commodity agriculture. In the United States alone, Monsanto controls over 90% of the soybean production and over 80% of both corn and cotton production. For fiscal year 2013, Monsanto’s net sales crested over $14.8 billion, and its net income grew a staggering 21% from the previous year. In October, Monsanto paid $1.1 billion cash for a little-known entity called The Climate Corporation, an agricultural insurance company founded by former Google employees David Friedberg and Siraj Khaliq, that uses big data and climatology to predict risk. 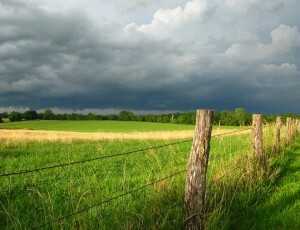 With a technology platform that monitors weather measurements from 2.5 million locations to generate daily climate forecasts, Americans can be confident that Monsanto is watching the land. Photo by Oakley Originals/CC BY. By contrast, The U.S. Department of Agriculture’s Economic Research Service says that sales of organic products account for an estimated 4% of total food sales. The vast majority of these sales occur in conventional grocery and natural food stores, although direct-to-consumer sales have steadily climbed over the past twenty years. In 1994, the year that the U.S.D.A. began tracking them, there were less than two thousand farmers’ markets in the U.S.; by 2013, that number had quadrupled to over eight thousand. Fruits and vegetables account for the bulk of organic sales, for which consumers may pay a high premium. In California, which accounts for over one-third of the nation’s total organic production, weeding by hand can cost farmers more than twenty times per acre what it costs conventional farmers to spray chemical herbicides. Many producers hire undocumented field hands in an effort to cut costs. Several years ago, I spent a season working on a diversified organic farm in Massachusetts. At the time, I was the only American citizen who worked in the fields. It was, quite literally, backbreaking labor, and I was constantly amazed by how my Mexican co-workers could pick a quarter-mile row of kale or lettuce without standing up to stretch and rest. They were funny, energetic, dependable, and observant. On farms nationwide, these unprotected workers are watching the land. The recent growth in the number of college farms, sustainable agriculture programs, and food-related courses, including those found in traditionally liberal arts schools, represents a strong movement toward the resettling of America. There is no single model for a college farm. Many provide food for student dining halls or local food pantries, while others encourage students to engage in sustainability research. Sustainable agriculture programs are changing the demographics of the American farmer. Nearly 25% of farmers now possess a bachelor’s degree, up from the 4% who held degrees when Barry purchased Lane’s Landing. In 2000, concerned students in an environmental health and policy class taught by Professor John Wargo at the Yale School of Forestry and Environmental Studies formed the organization Food from the Earth to promote conversations about food and sustainability at Yale. When the influential Bay Area restaurateur Alice Waters’ daughter Fanny Singer came to Yale in 2001, Waters met with then President Richard Levin about the quality of food being served in the dining halls and the disparity between the university’s classrooms and kitchens. That conversation, and Food from the Earth became the genesis of the Yale Sustainable Farm Project. 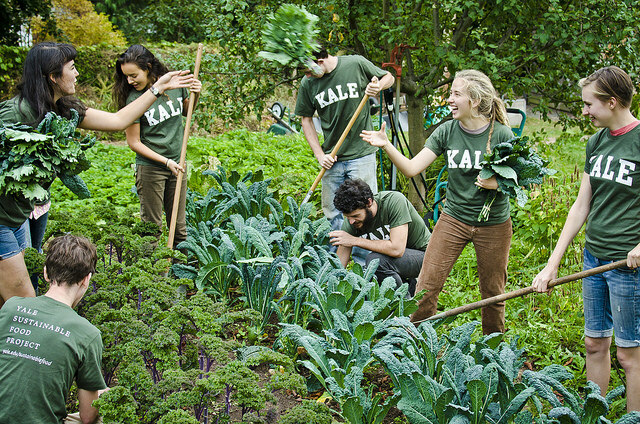 A decade later, English majors harvest kale alongside architecture students at the farm, which offers undergraduate summer internships, and has hosted sustainable food conferences. Students also develop a better understanding of larger food systems by selling produce at a local farmers’ market. The project has also expanded to Yale’s new campus—the West Campus Urban Farm integrates community and academics, including students from the nearby Yale School of Nursing. Although Yale is not an ag school per se, it now offers over twenty courses on food and agriculture each semester. The farm brings students together from across the campus. Photo by Philipp Arndt. In addition, the project is reaching out to the greater New Haven community through its annual Seed to Salad program. For five weeks in the spring, second graders come to the farm to learn how to grow food. Their visits begin with a dance, incorporating “fun” into the curriculum. “Working together is a little like dancing together,” Berry observes. Back under the farm’s pavilion, the conversation turns philosophical as students discuss the current state of culture and agriculture in America. Timothy is Editor in Chief at SAGE Magazine. A former high school environmental science teacher, Timothy now studies environmental anthropology and writing at the Yale School of Forestry and Environmental Studies. Tim. Thanks for this article just full of important and interesting information. It is nice to hear that somebody is thinking in a practcal way about future American landscapes.